Portland’s TriMet has appointed Samuel (Sam) Desue, Jr., chief operating officer (COO), effective March 18, 2019. Desue will lead the agency’s Transportation and Maintenance divisions, oversee TriMet’s Information Technology (IT) Division and provide leadership to the Safety and Security Division. “Transit is critical to the citizens of the Portland metro area. I look forward to partnering with the general manager to set TriMet on a strategic path for the future,” Desue said. Desue has more than 22 years of public and private transportation experience. 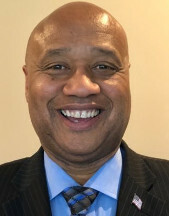 He most recently worked for the Kansas City Area Transportation Authority (KCATA), which he joined in 2013, serving as chief operating officer, interim general manager and, most recently, deputy chief executive officer. While working for KCATA he set priorities for the agency, developed a five-year strategic plan, improved on-time performance, promoted industry best practices and technologies, and implemented a safety/security task force. Prior to KCATA, Desue worked at Pierce Transit, where he moved up from senior transportation manager to vice president transportation services. He also worked at Community Transit in Washington and oversaw ground transportation at SeaTac International Airport as well as operations at Seattle Monorail. Desue serves on the American Public Transportation Association (APTA) Board of Directors and on the APTA Operators Committee. He is a veteran of the U.S. Army.